I shouldn't worry too much about Maidenhead Cal, in 2015 even during the warm up pre race I felt that it was going to be a tough job to get under two hours but ended up blitzing it in 1.51 which is still my pb over that distance. I'm making slow and steady progress recovering from a long lay off but had possibly my favourite run in a couple of years on Wednesday when I tried a trail run for the first time and thoroughly enjoyed all eleven miles of rolling up and down the South Downs! It took 2.45 to do eleven and a half miles but I was happy enough just to get the miles in. I'm out for a short one this afternoon but that'll be back on the roads! Well I don't know... I did a little recovery run today and my hip tightened up after three miles. This has happened before to the other hip so I know it's not a serious injury but, on top of the infected bug bite, the hamstring tendon and everything else it's a nuisance. That and (after a good day yesterday) I'm feeling rather under the weather. Not sure if it's a side effect of the infection or a summer cold, but certainly not what I need. I guess I'll have to take some more rest and hope it clears up by the weekend. Sorry to hear of the insect-initiated trials. Apart from the annual visitation of flying ants, Crosby & Waterloo are not hot spots for bites. Gritty racing, Hazel - and good to get back in the room, Will on your run. Nessie, hope the domestic arrangements settle soon. I've a friend who lives close to Mersea Island - she races the 10 every year. You'll be able to follow your son's progress at college. Good run for your confidence, Matt. Sunday night: 10.4 miles path, trail, prom & beach; one comedy fall - well, it was more of a lean over on a sloping bank - and not-so-mysterious lights up the prom, necessitating a detour. If trouble's about, it'll take advantage of the night. Knee is rather pants atm but I recovered this eve with 3 miles over the coastal park. Your 10 miles on a dodgy knee sounds alright, Swittle. Nice run and lean/fall. Great hill-running PMatt. That too sounds like a really nice trail and a great boost post-injury. Hang in there, Cal. Hope the clear up. Great work as usual, Hazlenut and ace sprint finish! Hope all is settling down well for you, Nessie. I got out on the trail today, in prep for my trail HM on 24th Sept. I hadn't realised said trail had grown into a Triffid route over tha last few weeks. Nettles 4 foot high stung the crap out of me and the riverside reeds were over 7ft, hiding a fallen tree that I almost broke my neck on. Anyway, I managed to find the lake eventually and my new trail shoes held up well. Felt a lot better form-wise and lungs starting to remember what they're designed for, so I ended up doing just under 10 miles in 1hr 39mins - more than I had planned and a satisfying pace. Fleeting views of a Cetti's Warbler and a beautiful 20lb carp being unhooked were the natural highlights. In other news, I've just finished fermenting my first batch of kefir milk. The Croatians swear by it and they're even making it on The Archers! May just be the answer to the old GI issues. Some nice trail runs going on. Will - my skin started crawling at the mere thought of the triffids - my parents watched the 1981 series on BBC when I was a kid - I was terrified of them. Good to hear from you Nessie and well done on the 10 mile race. Hope you are feeling better Cal. Today flat 9,8km in 48:13. Ran late morning again - wise decision as it is currently 31 degrees outside. Could have done with a bit longer between runs but no time to run this evening. Hard work with 5km with splits below 4:43 / km and 4 others with < 5:00 / km. Rest day tomorrow but I am looking forward to an autumn run on Friday - pouring rain and max. 15 degrees forecasted. 8.1miles in 58:30 yesterday. Not quite in the realms of tempo pace but not far off. On a long, clear, wide stretch of road the single car I met buzzed close and blasted his horn. Okay there is a pavement, but still. My fuse is short running at pace and I didn't react constructively. Anyway, the swearing and adrenaline fueled me for a bit. In sympathetic news I too have been bitten on the leg by an insect beastie. Bought some hydrocortisone cream today. Great running MLRers, and sympathy to those being stung. Some decent distances here and some good nature spots Will. I'm doing a SwimRun event on Saturday. It's a relatively new type of event and my first. A total of 8km run and 4.5km swim divided up into around 8 bits. You do it in a pair and whatever you start with, you finish with. So a wetsuit to run in, and shoes to swim in. It is slightly mental really. I don't often push too hard on runs, as I prefer a bit of a long plod over all this speed work stuff. That's why I always went in goal, I suppose. Last night I decided to give it a few good 'spurts' and generally run a bit faster overall. I was pleased with the results. Instead of the 4 miles at 9:30 mi which was on the plan I ended up doing 5.37 miles at 9:15 mi in 49:44. Recovery time seemed quicker than usual too. Not fast by some standards, but pretty quick for me Happy running all! Good to have the range, Will. A coach said, 'If you want to race faster, train faster.' Needless to say, I declined to follow this advice. Good stuff, everyone. Not such great news for me, unfortunately. I went to the docs on Tuesday and got some antibiotics, which have helped heal the bite (it has stopped itching, anyway) but my hip has been rather cross and I've stuck to yoga for the past few days. I decided to try a run this morning. Energy was pretty good but I could feel the hip all the way. It's soft tissue, definitely - no sharp pain or anything - so I could run with it, but I also felt a bit woozy during the last mile. I was coming down a little hill and felt I might almost lose my balance if I didn't slow myself. This happened on Monday too. This is either down to the infection or the antibiotics, or the fact I didn't sleep much last night. I had a nap when I got home but still feel underpar. I have a massage this afternoon and will make a decision about Maidenhead tomorrow, but I think a DNS is likely. I could get around, certainly, but I don't want to stuff myself up for my target races. I'll see what my masseur thinks. He's pretty smart about these things. Sorry to hear that Cal. A DNS sounds like it might be a good idea under the circumstances. If you do run good luck and that you get round without too much discomfort. Have lots of fun tomorrow Nessie. I thought you aren't supposed to pee in wetsuits? Careful JT, getting hit by a car hurts, since it happened to me a few years ago (not my fault and not a running incident) I react badly to cars getting close. Swittle, Will - I am in the train faster race faster camp I'm afraid. Whilst I'm chasing Pbs and preparing for important races I'll keep it up but in a structured sort of way. Note to self: do an lSr on Sunday, not an lFr. Today's 10km run was another tempo outing - felt very good as it was cool for the first time in several outings which suits me much better. Agricultural highlight - some Galloway cows - some with cummerbunds and others who looked like they had dipped just their noses in jet black ink. Also ran past a group of people distributing dog treats and orange flags all over a field whilst their dogs were patiently waiting. Not a bark to be heard. Cal, you know it's not worth it. I know it's disappointing if it's a race you've signed up for, but like you say, it was not the target one. It's not worth knackering yourself. Hazel- cows with cummerbunds sound cool. My masseur told me it was a bad idea to run on antibiotics so I'm going to DNS, sadly. He did some work on the hip and found it horrendously tight. Feels a little better now but between that and feeling now right, I'm going to rest up and stick with yoga for a few days. Really bad luck there, Cal. Try and enjoy the rest?? Yoga's not a bad fallback. I've been getting back into it and love it. Pushed myself again today and, one week back in training after holiday, I nudged my Parkrun PB with a 25:24. Got stuck in the bottleneck start too, so reckon I can push further next time. I may start at the front with the 16 minuters and look tough. Well done, Will. I was timekeeper today - it was my 25th volunteer so I now qualify for a purple shirt! (I daresay I won't be able to get one for a few months, going by how long other people's shirts arrive, but hey.) Did two yoga sessions too - Yin at lunchtime and Vinyasa just now. Vinyasa is tough but somehow I always feel better after it. Cal, let the meds do their work - and you'll be sooner mended. The yoga sounds ace. Nessie: I'm sure you'll not be tempted into too much that is silly! Good luck! Great to see your improved parkrun time, Will - more to come! 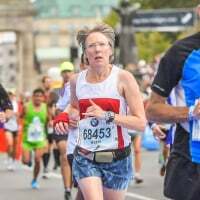 I also subscribe to fetcheveryone.com and, checking my running log a couple of days ago, in the 9 years I've been on the site, I've recorded 17000 miles. Streak assisted, of course! I've got 8 duck flea bites on my face and neck after Saturday's brilliant swimrun. That is the only downside-- they are itchier than mozzie bites and the itching persists for 1-2 weeks. Second time I've had them. The swimrun was amazing! We weren't last! And we finished in well under 3 hours. Around 2 hours 40 I think including the transitions. We did about 4.5 km swimming- which I was well pleased with as previously the most I've done is 2.5. And around 8 km run. Broken up into small bits. Weirdly the run was the hardest- the 3rd run section which was only 4km but it went around a boiling hot motocross circuit (all the running was XC). I tell you, that in a wetsuit and swimming cap is bloody hard work. But doing the event in the pair was the best as we laughed all the way round and kept positive. It was so refreshing not having to fiddle around with shoes / wetsuits etc. It did make you feel a bit amphibious. We are now looking at events for next year. The big UK one is in Wales, but it's expensive. I'm still pretty tired after Saturday's efforts and had an easy bike ride yesterday morning where my legs felt like lead. Will try a lunchtime run today. No students yet so work is fairly easy. swittle I hope you will run many thousands of miles more - that is really impressive. Great swimrunning nessie. It would take me forever to swim 4.5km - can only do granny style breaststroke. Saw one of the brown bears in the bear park next to the river. Naturespot: a few big blue-green dragonflies. Quite a few other runners out but hardly anyone replied to a greeting - miserable bunch. Tired by around 18km, last week's hard work catching up on me I guess. Tried a gel for the first time - was a bit apprehensive but no digestive issues. Found it a bit gloopy but the taste was ok - fairly neutral with a distinct hint of salt. Also devoured a fruit puree which I like - they are designed for 4+ months - I passed that a long time ago! Lunchtime today: 5km recovery jog in 31 mins on tired legs. I love dragonflies Hazel. I've never got over the childhood excitement of seeing them skim over the surface of the water. Why are you trying gels? Have I missed something- a marathon? Hi guys newbie here. Well more of a reintroduced runner really. Hope you're all enjoying things at the moment. That's what it's all about I guess. i'll not bore you all too much with my story but as I say I'm just getting back into it after a few years off. I live in Buxton in Derbyshire these days but originally from Doncaster. There's a 10k in Donny in November I'm aiming for so just now im getting out about 3 times a week trying to slowly increase my mileage. Hill sprints tonight. Possibly one of the main reasons I've been putting off getting back into running again for so long. id forgotten how truly savage they are! The hill I use is about 40 metres in length but has around a 20% gradient for the majority of it!! Welcome, readyeddiego. Pleased you're pulling on trainers again. Good luck with your training - no shortage of decent hills around Buxton! The bite has healed nicely thanks, Nessie (though it still looks a bit icky) and I've been off antibiotics for a day now. However I'm not back to full strength. I did an experimental run today - walked to the common (stopping en route to pet a lovely friendly Burmese kitty), did a few drills, then jogged two miles and walked back. I wasn't sure how long the run would be but I felt quite tired and had no real inclination to continue after the 2 mile point, even though the weather was lovely. I just felt tired and still a bit off-kilter. At least my hip didn't complain, though. I've just a week and a half to get back to normal - hope I make it. That's encouraging news, Cal, hope recovery continues. Dragonflies still zipping about in Norfolk, Swallows too. It's late for both - another sign of climate change. I've been upping the mileage a bit and am really enjoying my longer runs. The pace is creeping up too. My wife has uttered the word 'obsessed' - how dare she! Last night I plodded out 7.5 miles at 9:46 mi, which kept my mind off the return of the kids today! My new class, however, seem very nice. In bitey news I've treated next-doors' cat for fleas. I think that's how I got some really stubborn bites - not on a par with Cal though. The cat sort of moved in and we feed it as the neighbour buggers off for days on end and doesn't bother with it. Crap cat, but someone's got to look after it. Anyway, 20min treadmill run yesterday at the end of a gym session. 8.5miles today. More comfortable in the cooler weather. Put in a 6:50 mile near the end which is the quickest for a while. Nessie I'm doing the marathon in Frankfurt on 29.10. The gel testing was partly curiosity as I picked up a couple at an expo. Hello readyeddiego. Sounds like you have a good plan. 20 % hills are nasty. Keep it gentle until you feel better Cal. The swallows have been very busy the last few days here Will but strangely I don't think I saw one today. Nice of you to look after the cat JT. Swift mile. Swallow as also the operative word at the outset of my run today - 50 metres from the doorstop I didn't apply the tooth filter quickly enough and spent the rest of my run digesting some sort of fly. Extra protein won't hurt I guess. 14.2km in 1:11:08 for me today. The tempo runs are increasing in length and decreasing in pace. Quite enjoyed it after setting out in quite an agitated state from work. That is a swift mile, JT. Can almost see your dust trail! I hope preps for Frankfurt continue to go well, Hazelnut. I've heard it's always a great Marathon. How are you going to taper? I have a trail half on 24th Sept and am pondering my taper for that. For my first half I think I overdid the taper a bit. I basically didn't run for the final week before the event and think I actually lost some of my puff. Any tips? I had a tempo-ish 4 miles in a nice bit of rain last evening. Legs and joints feeling a bit tired with my increase in mileage, so taking 2 rest days before a practice 13.1 on Sunday. Carry on taking it easy and listening to your body Cal, and fingers crossed you'll be OK for the next one. Welcome Eddie, I know that part of the country a little as I have family there, and it's beautiful, bracing terrain! Thanks to you & Hazel re miles run - I was a little shocked myself. Hazel, tidy offroading, with contrasting fauna. Cal, am glad you seem to be on the way to full recovery - it's been nasty, hasn't it? Out at 7am, catching the end of a pretty heavy period of rain. Warm, though. Only a couple of dog walking regulars out, including Betsy, the petite sheepdog. Listening to a zydeco version of 'Hey, Joe'. Every tenth Sixties band seems to have recorded it!